As I finally finish unpacking from my Alaska trip, and start to re-pack for my trip to the Pantanal in Brazil, I realize that in Newsletter #36 I failed to mention anything about my upcoming ten-day Photo Safari to Ecuador’s rain forest & cloud forest on November 4 th-14th. Please visit the “safari tour” section of my website for details and also go to the Ecuador photo gallery to view just a few of the images of flora & fauna from those areas. One of the very special attractions of this particular trip is that “getting there” is as much a part of the adventure as “being there”! We fly into the beautiful, modern, colorful (and very historic) city of Quito, the capital of Ecuador. I’m seriously thinking of adding a few days up front to the trip so I, and others interested, may tour the special spots this city and the outlying areas have to offer. I loved what I saw on my last two visits there, but just couldn’t take the time to really explore and photograph. 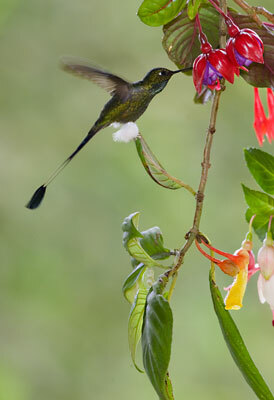 Quito is the center for our two destinations; the rain forests and then the cloud forests. 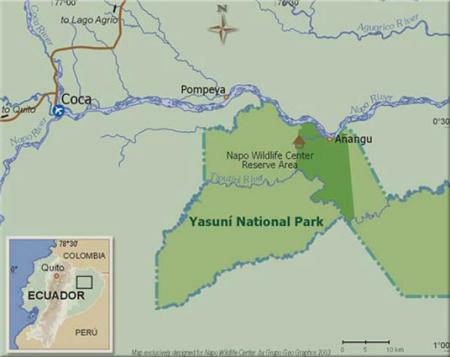 Our main destination and longest visit is at the Napo Wildlife Center Reserve located in the Yasuni National Park. As I said earlier “getting there” is part of the adventure. 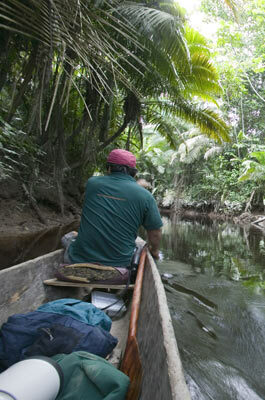 After a short 20 minute jet-hop to the town of Coca and a brief van ride to the dock located on the Napo River, we board a large, motorized, canopy-covered canoe… I’m having fun just thinking about it!!! We sit back and enjoy a wonderful, scenic two-hour trip down the Napo River until we come to the entrance of the NWC Reserve. Now get this… it’s the best part… we switch to smaller, dugout canoes and are paddled up the blackwater creek to the lake and lodge. (I am now playing my favorite roll in my fantasy world--- a lounging Cleopatra being paddled by her sherpas! Only difference is I’m holding a camera viewing & photographing the fabulous rainforest’s scenics, beautiful blackwater reflections and critters along the way!! Well… maybe that’s not the only difference, but you get my point). Soon you round a bend in the creek and float out onto a gorgeous little lake and behold the thatched roofs of the Napo Wildlife Center Lodge! Believe me or not, this is a Five-Star lodge regarding its accommodations for guests, but more than that it is truly, a legitimate part of the conservation efforts for this area (and should be considered a ‘flagship’ for Ecuador’s conservation efforts by its example). 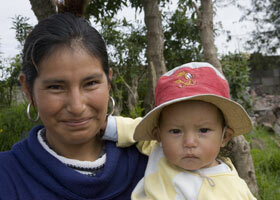 Logging, market hunting, and oil extraction are all actively destroying local forests. The local community of Anangu decided years ago that it was not going to succumb to the local pressures to destroy the forest. (Not everyone is greedy!) This is an oversimplification of what is a complex setup, but the bottom line is that ALL the proceeds from this lodge go directly to pay for the conservation of the 82 square miles of this pristine lowland rainforest!!! Knowing all this only enhances my desire to encourage tours (with or without me as your photo-tour guide) to this beautiful part of the world!! 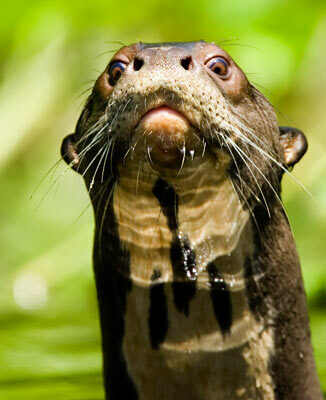 The canoe adventures are a photographic challenge as well as incredibly rewarding when such surprises as the giant otter suddenly springs up out of the lake inches from your nose & scolds you for treading near his territory. You frantically grab your camera, quickly compose and click… I got it, you think, and maybe you did and maybe you didn’t, but it was still fun trying! ‘It’s all in the journey. I sent specifications and pictures of my specially-designed-for-my-Foto-boat- beanbag- pillow/seats to Norby Granda, the general manager of Napo, and he agreed to have them made up for my tour groups as tripods are out of the question while shooting in the canoes. I handheld the 500 mm lens with 1.4x mounted on my Mark II while there this January, and managed to get a number of sharp images, but it was hard. I’ve successfully used my beanbag seats while shooting on the Fotoboat, and know it’ll make canoe shooting a lot easier and sharper. There are terrific photo (or just plain viewing) “opps” out on the lake and creek near the lodge. A trip or two to the clay lick blinds is a must for my groups. At certain times of the day (which is like clockwork) various species of parrots (mealy, yellow-crowned, orange-winged, blue-headed parrots, & dusky-headed parakeets) & scarlet and/or red-and-green macaw flock to these areas to eat the clay. 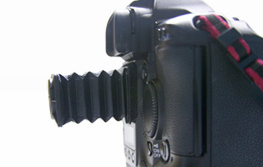 This entails some walking, but our guides will help us with our equipment, including our tripods. Boots are provided by the lodge as it can be muddy along the way. Boot tip to follow later. As part of this 10-day excursion, we will leave the tropical rain forests and head UP into the magical & mystical cloud forests outside the city of Quito. Even though we are near the equator, the temperature will drop to be cool or chilly. The expansive scenery will be a patchwork of greens and gold with snow-capped mountain tops peeking out through puffy white clouds floating by us at eye level. Wild flowers, wandering llamas, and quaint little farms dotting the country side are cause enough to stop and shoot some shots. I love to stop and shoot the quaint churches along the way, as well as the beautiful faces of the local children (when permitted) & other residents----their black eyes, rosy cheeks, and warm smiles soften this hardened heart. 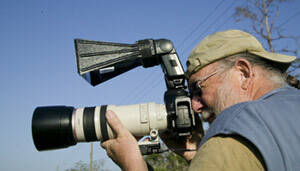 We will have ample opportunity to spend time photographing various species of hummingbirds, and other species of birds. 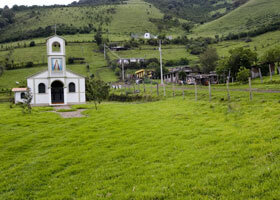 Again, please visit my gallery on Ecuador. There are two openings left available for this trip on November 4 th -14 th. As I have often stated in most of my newsletters and brochures, you do NOT need to be a photographer to enjoy these adventures. I’m sure you will always get outstanding service from anyone you talk to at Neblina, but I’d like to think of Xavier and his wife, Mercedes, as personal friends who would give any one of my newsletter recipients “special” service!! Don’t be shy and be sure to tell them that “Joanne Williams sent you”!! I’d love to hear any feedback you may have.